With the Olympics and Queen's Diamond Jubilee, tourism in the UK faces a massive year. The Magazine asked non-British born people to describe the part of the UK that sums up a more unusual aspect of British life. 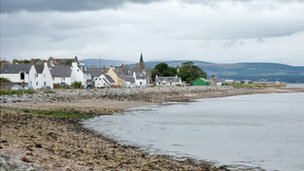 Here Australian novelist Helen FitzGerald explains the lure of Cromarty in Scotland. I grew up in a small town 60km (37 miles) north of Melbourne. As in all other Aussie towns, there was a sign as you entered: "Kilmore, population - 2000." Kilmore wasn't the gateway to anywhere, wasn't a site of historical significance and wasn't oozing natural resources. It didn't have the world's largest pineapple or a huge concrete merino sheep or a beach or even a lake. But 2,000 suckers from all over the world had ended up living there and in Australia, my friends, that is something to brag about. 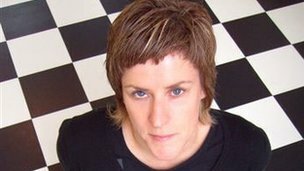 Novelist Helen FitzGerald grew up in Victoria, Australia, and lives in Glasgow. Her crime thrillers have been translated into a number of languages. Blue sky, yellow grass, gnarled trees. Blue sky, yellow grass… gnarled trees. Our destination was a town consisting of a dusty strip of low-lying shops, a colonial pub, a park and enough houses to accommodate the 1,500 people listed on the sign. It was, in fact, identical to the one we'd departed from five hours earlier. We'd eat our sandwiches, play cricket on the yellow grass, then drive home. I live in Glasgow now, and once in a while my husband and I pack the kids into the car and head north to one of our favourite places: Cromarty. As we drive, I look out the window and marvel at how much the view and the weather change every few minutes. Grey sky, Glasgow, brown river. Black sky, Stirling castle, green hills. Blue sky, ski lifts, brown moonscape mountains. White and black sky, Kessock Bridge, Beauly Firth. We're asking non-UK born people to describe the unusual places that sum up a less-explored side of the UK. Send us your suggestions - and pictures - of any place in England, Scotland, Wales or Northern Ireland - using the form at the bottom of the page. Cromarty. Population - who knows? It's not just the drive I love. It's the place. Everything about it is so very un-Australian. Located on the Black Isle north of Inverness, surrounded by rolling farmland, overlooking the Moray Firth and blessed through an accident of geography with unusually mild weather, Cromarty is the Highlands' best-preserved historic town. Fine Georgian merchant houses and 19th Century terraced fishermen's cottages nestle in its pretty streets. In Australia, any building over 50 years old would have its own national holiday. Here, they are everywhere and they are gorgeous. It's a place with an exciting and unpretentious mix of people - which makes for a friendly pint in the pub and an extraordinary amount of creativity. 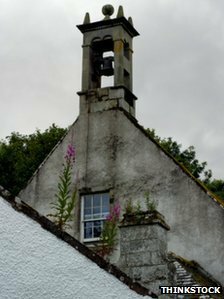 Cromarty is one of the "sea areas" and "coastal stations" that feature on BBC Radio 4's Shipping Forecast - to many a mysterious and hypnotic litany of names and numbers and weather forecasters' jargon. Four times a day, weather conditions and forecasts are broadcast, providing precious information to sailors out at sea or those planning to set sail. Cromarty joins other enigmatic-sounding places such as Viking, Dogger, German Bight, Fitzroy and Rockall - each defining a sea area of several hundred square miles. This tiny town of 719 (being an Aussie, I had to find out what the population was) has a film festival and a convention centre for writers, where numerous other events are held throughout the year. The lovely stone houses are filled with writers and artists and film-makers (like my pals Don Coutts and Lindy Cameron) as well as people with "real jobs". I go home to Australia almost every year, and each time I go I feel that the classlessness we've prided ourselves on is a myth. Snobbery is rife in Melbourne. It's rare you get the sort of mix of people in one room that you get in Cromarty. But mostly it's a real place, and nothing makes this more obvious than the huge in-your-face oil rig a few hundred feet offshore. Old and new, beautiful and functional sit side-by-side there, proudly and unapologetically. In the early days, I wouldn't have thought twice about eating lunch then heading back to Glasgow. 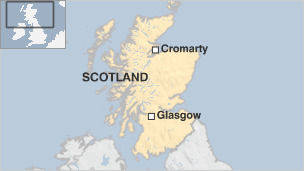 In Aussie terms, Cromarty is "just around the corner". But I've acclimatised now, so we usually stay overnight. And it's the sort of place you want to soak in. There's no hurry. 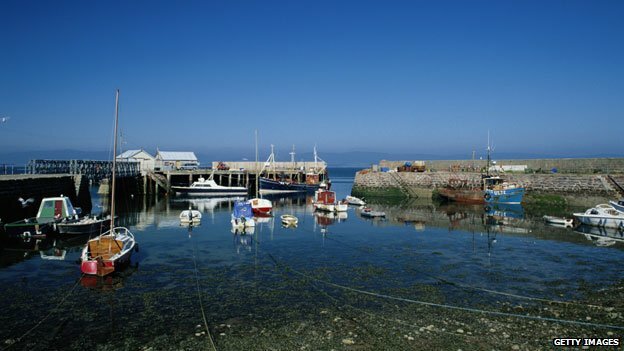 Why not stay a while and check out the court house museum, eat at Sutor Creek Cafe (yum), walk along the shore, have a pint, chill out? My husband's there as I write, working on a TV series. He called the other night and I could hear the place in his voice - inspired, full of ideas, but relaxed and happy. I did the trip north for the Cromarty Film Festival in December. A week later, I flew home to Australia with my family. Despite the monotony of my childhood trips, the first thing I wanted to do was drive my kids for hours and hours through unchangeable flatness so we could play cricket on the yellow grass in Nathalia. For me, I guess it's how different these places are that make them so special. The place I would choose is ... Stonehaven , on the East Coast of Scotland, more by good luck than management I discovered this Magic Village. If I had to chose a place for me, In all of Scotland It would be, This little Gem by the sea, Stonehaven... Thats the place, for me. My suggestion is the Saxon port of Watchet, Somerset (also the 'home town' of the Ancient Mariner). I am Canadian, though I've spent parts of my life living in Amsterdam, Frankfirt, Rhiyad and (briefly) in Singapore. Here in the UK I keep returning to Islay, off the West coast of Scotland. I first came to Islay on a diving trip, unusual enough in itself. But I keep returning for the scenery, the whiskey and the strangely modern but insular people there. Plymouth! I know people hate that place - but there is something about it I really love. For me, an expat New Yorker, it's a tossup between northern Wales and Northumberland as favourites. Love the sheep and the strange language of Wales, plus the local cheese, smoked fish and castles. In Northumberland, it is the puffins, the open space and Lundy Island. And the castles. I also love Lyme Regis. Who wouldn't love a place where you can pick up dinosaur bones on the beach? There's really no place like Fryup. Made famous for it's quirky name (to be seen on mugs and cards around the world); being the backdrop for the TV show Heartbeat; and for being smack bang in the middle of the eerie and sometimes spooky North Yorkshire Moors, I am forever grateful to have the good fortune to be able to stay in such a beautiful corner of the world. You won't find a pub for miles, and accommodation is hotly contested, but if you're fortunate enough to spend a weekend there, you'll find the locals very welcoming and the walks and vistas incredible and quite unforgettable! Swainby in the Cleveland Hills. Incomperable greenness. Newts, bumblebees, hedgehogs and squirrels. Alien and forbidden in Australia. I completely identify with so much of this article! As an Australian living in the UK for the past 12 years, I find this place utterly breathtaking in so many ways. Moving here enabled my inner history geek to shine through! In Australia, an 'old' building is around 100 or so years in age. For me, the place that 'knocked my socks off' was Kirkwall, in Orkney, Scotland. Reaching out and touching Kirkwall Cathedral (built in the 11th century I believe) was an astonishing experience. To know that I had my hands on a building that had been built so long ago - that a thousand years before, someone else's hands had been there - wow. I definitely believe that more money and care should be put towards the UK and Ireland's amazing heritage. For such a tiny place (to an Australian anyway), this place is crammed with historical and archaeological wonders! I am originally Canadian, but my favourite place in the UK has to be Fair Isle, the most remote inhabited island in Britain. The island appears like a jewel stuck out of the ocean, with nothing else around it. The enormous sea cliffs are home to tens of thousands of sea birds, including colonies of completely fearless puffins. The people are kind, welcoming, and really quite cosmopolitan. The journey to get there requires commitment, but the payoff is tremendous. Having been born in Florida, the history of a place like Winchelsea, East Sussex is nearly overwhelming. I love that it used to be a port where ships could sail right up to the medieval walls! It has everything: beautiful views in every direction, rolling hills, cliffs, ruins, ancient buildings, and its own shingle beach. Life seems slow and easy, but you are only an hour outside of the M25. Cornwall, where I live now, is one of the best places in the world. However, interesting to read of Australians, from the home of some of the worlds oldest human history, totally igonoring the wealth of Aboriginal heritage on their doorsteps and talking of 100 years as being old!! to me though, it's all about the people. Comments: The Fosse Way, although not so much one place, sums up Britain for me. Built by the Romans, it is a stage for all the subsequet layers of social and architectural history; ancient and modern, sacred and secular, rural and industrial, beautiful and mundane. Cutting through the heart of England, it's both historic and functional - we use it to travel from our home in Northamptonshire to visit my husband's family in Dorset in peak holiday periods when we can't face being stuck on the motorways or A34. That's the real Britain! As an aside, I don't think John Dickinson need worry that we expat Australians are ignoring the vast wealth of Aboriginal history. The comments here appear specific to the built environment. Like Helen FitzGerald I am from a small Australian country town with a population of 8,000 (Western Queensland) but have lived in the UK for many years. I can identify completely with long car journeys through incredibly dull countryside and towns. I too couldn't wait to show it to my children! My favourite place is where I Iive, Buckinghamshire. So pretty, so close to London and so many places of interest in such a small area it's wonderful. Nothing unusual I am afraid, just very pleasant. I can' think of anywhere in Australia that can offer this. For me, there is no place like Stromness in Orkney, Scotland. Yes, it takes a bit longer to get there, tho not as long as you might think...rail and ferry service is excellent, but the entire Orkney Mainland is simply Magical...especially if you are into Neolithic and Bronze age sites. And sailing into Stromness from Scrabster/Thurso, you are transported into a world thought long gone. Great Accommodations and Food a'plenty...the people are wonderful! Simply an unforgettable place. I was lucky to be visiting a wonderful place called Aviemore in Scotland as part a one week training Besides having a wonderful view of the Cairngorms, I was also lucky to have pics taken with Spud the famous Highland Bagpiper! Aviemore is splendid location, an awesome getaway with beautiful surroundings and a pretty railways station. I simply fell in love with the place !